Are you a professional musician, an adept conductor or you are just starting your very first music lessons? One equipment you always need is the music stand. As a must-have equipment for an artist, music stands to keep your music scores neat as well as easy to read while playing the instruments. A professional musician always makes sure it will not fall over in the middle of performing while a new artist always needs it nearby in every practice. With all the different types of music stands out there, it can be a very frustrating experience to find a best one for yourself. That is no longer a problem, as we will present you the top 10 best music stands in 2019. The list below compiles of brief reviews of the chart-topping music stands solidly built and packed with many exciting features. Therefore, you don’t need to spend hours deciding which to buy as we hope you inevitably find one that suits you best among these gears. We start our list with SM7211B, which comes with the charcoal black finish. A tripod integrated with this music stand is a useful feature for traveling and storing. You basically fine-tune bookplate’s angle with the tension knob underneath the plate, or you detach the top entirely. The stand is made of high-quality plastic and has non-slip rubber feet to secure its position. Quickly adjust the knob by hand. Another equipment you should not miss is SMS-20. Made out of finest steel, the stand is yet portable as well as adjustable. SMS-20 comes with the maximum height of 47” and weighs only 5.5 pounds. It also has two clips which would tightly hold the sheet music together. Moreover, the frame is collapsible making it easy to fold up into a lightweight bag. If you are a traveling a lot, you should consider this. Looking for something more robust that can withstand even a thick book; this music stand is sturdier than you might think. Virtually made of steel from the frame to the deck, this piece of equipment is suitable for a professional on stage. It is a quality product, but the price is affordable. The adjustable frame can adapt to your style, and you would find it pleasing to be able to tilt the bookplate vertical flat. This jet-black music stand is built with lightweight, robust material allowing this gear to be portable and sturdy enough to hold your papers intact. Ideally suited for studio, this stand provides flexibility with height-adjusting knob and tiltable tray. The stand can extend up to 46” tall, yet it will not fall over. The magnetic binder on the plate will stick sheet music to the tray. Here is another high-quality piece of equipment from Gearlux, a well-known brand for its affordable musical gear. 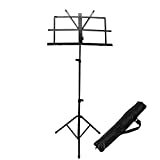 Designed for orchestra performer with its robust tripod and frame that can be lengthened from 28 to 48 inches. This metal music stand is an engineer to maximized longevity and portable. It goes along with any kind of the instrument and any style. If durability is what you are looking for, this music stand made by Manhasset might be what you need. With easy and automatic adjusting neck, its tray can deliver the optimal position for the pleasant viewing experience. With the black finish metal with chrome inner shaft, this piece of stylish design would suit for any artist. The stand can withhold heavy load on the top while keeping itself steady. Three rings on the tray bind the papers pretty well. The design of this music stand is top of the line when talking about portability. The frame is adjustable for sitting or standing position. The foldable extensions are large enough to hold up to three sheets next to each other. Each part can be folded down flat make it convenient for storage. The friction locking mechanism allowed fine-tuning the angle of the bookplate easily. Its maximum height is 42” and surprisingly weight only 2.5 pounds. 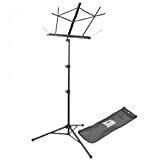 With the same design concept as the previous one, this lightweight music stand is suitable to take along with you wherever your next practice is. However, the stand does not topple over easily. It is fully adjustable and foldable. The price is not that high. What surprising though is that it weighs only 1.7 pounds. The bookplate comes with two sliders allowing you to customize the opening and closing of the stand smoothly. The spring-load mechanism attached to the plate take optimization to the next level. If no music stand we mention above is your standing height, then this one will surely do the job. 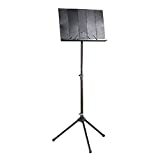 This black and great music stand can extend from 37” to 58”. Its slim design also allows folding it into considerably small size. Assembling and adjusting this gear is so straightforward that you can do it without the manual. The lip of bookplate is quite deep which would hold your sheet music nicely. The tripod and rubber feet keep the whole frame steady. Finally, ChromeCast music stand comes on the top of our list. This masterpiece is super portable, and you can quickly fold it with ease. The frame can extend from 28” to 52” tall and come with reasonable size bookplate. You can optimize the height and plate’s angle within seconds. The stand foldable and fit a bag making it easy to transport as the whole gear weight only 1.9 pounds. This little inexpensive music stand can be what you have been searching for. Having gone through the list of top 10 music stand available in 2019, we pretty sure you have already found one that suits you the best. The list covers all kinds of positions ranging from toughness to portability, but we also focus on the quality and the cost as well. 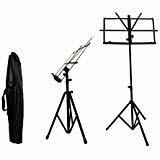 We are hoping that you would benefit from this list making your next shopping for music stand less tedious and if it does, be sure to check out our review of another kind of product as well.